If you’re looking to perfect your highlights or balayage you’ve come to the right place. West Coast Beauty carries every type of Foil imaginable from the best brands in the industry. 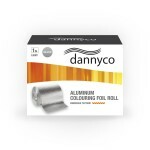 Dannyco Embossed Coloring FoilDannyco Embossed Coloring Foil is a rough-textured aluminium foil roll that comes in a built-in foil cutter.Size: 1 lbFeatures & Benefits: 361 ft - Light roll (ROF1LITNC) 295 ft - Heavy roll (ROF1HVYNC) Comes in only Silver foil Built-in foil cutter Cuts to desired lengths..
Foil Me Flatter Me Pre-Cut FoilPerfect for those who love a heavier, flat foil with superior grip and a fold. Saves you time, the signature embossing prevents slipping and assists with quicker processing time.Size: 500 SheetsOptions Available: Original (5" x 11") Wide (6" x 12")Features & Benefits: Convenient, this original and Foil Me exclusive box design allows neat and quick dispensing, withou..
Foil Me Grip Me Extra Wide Pre-Cut FoilCustom designed by Foil Me, extra wide and extra long. The widest and longest pre-cut hair foil ever and embossed for grip - PERFECT for long hair and hair painting. 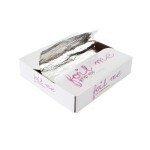 The Grip Me Extra-Wide are a fabulous foil for balayaging long hair, hair contouring and using wider sections at the back, separating colours with the bonus of conduct..
Foil Me Grip Me Originals Pre-Cut FoilFoil Me's superior signature foil; the original world renowned with the ultimate grip and flexibility. 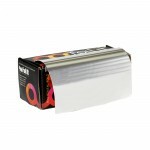 Grip Me Originals are Foil Me most popular foil and size - each box has 500 sheets. The Originals are perfect for fine hair as they are not too wide or heavy so the less foil used, the lighter they are which ensures ..
Foil Me Grip Me Wide Pre-Cut FoilPerfection foiling for balayage and ombre. Foil Me signature Grip Me Originals, but wider and longer. These are a fabulous foil for balayage, hair contouring, or if the user folds a lot. Each box has 500 sheets. They are also loved for the fact that you can do more highlights on one piece of foil than a narrower foil! Our..
Foil Me The Edwards Pastel Aquamarine Pre-Cut FoilFoil Me's superior signature foil; now in an exclusive aquamarine! With the world renowned ultimate grip and flexibility, these are a must have for all master colourists! Size: 500 SheetsOptions Available: Original (5" x 11") Wide (6" x 12")Features & Benefits: Saves you time, Foil Me signature embossing prevents slipping and assists with quicker ..
Foil Me The Foxy Pre-Cut FoilThese foils are perfect for those looking to add an extra splash of colour to your salon, ensuring your foiling creations stand out from the crowd!Size: 500 SheetsOptions Available: Original (5" x 11") Wide (6" x 12")Features & Benefits: Saves you time, the signature embossing prevents slipping and assists with quicker processing time. Convenient, the 'Flatter Me' box..
Foil Me The Knobel Pastel Pink Pre-Cut FoilPerfection foiling for balayage and ombre, now available in an exclusive pastel pink! Size: 500 SheetsOptions Available: Original (5" x 11") Wide (6" x 12")Features & Benefits: Saves you time, the signature embossing prevents slipping and assists with quicker processing time. Colour with confidence when highlighting and lowlighting. Love your work, pink ..
Framar 1 lb Roll - Star Struck SilverLight weight hair colouring foil that comes in its own dispenser box to cut any length desired. Or toss into the Framar Fold Freak Dispenser Mini for some cut n' fold action!Size: Light - 350 ftFeatures & Benefits: Multiple weights Dispenser box included with roll Fits in the Framar Fold Freak Dispenser Mini..
Framar 5 x 11 Pop Ups - Desert BloomThe new limited-edition Desert Bloom 5 x 11 Pop Ups will kick off your summer in style! The same Framar foil you love, but now with a warm, enchanting feel that will make your clients stop and say 'I want what she's having'.Size: 500 SheetsFeatures & Benefits: Embossed texture Worry free dispensing No rips, no tears Limited edition Desert Bloom pattern ..
Framar 5 x 11 Pop Ups - Star Struck SilverThese pop up hair colouring foil slide out easy with an embossed finish. They don't stick or tear when coming out of the box! No slip, ultimate grip. Pre-folded edge so you can go from the box, to the hair.Size: 500 SheetsFeatures & Benefits: They don't stick or tear when coming out of the box Pre-folded edge so you can go from the box straight to the hai..
Framar 5 x 11 Pop Ups FoilWorld's best Hair coloring foil. These pop ups slide out easy with an embossed finish. They don't stick or tear when coming out of the box!Size: 5"x11" 500 Sheets Colors Available: Man Eater Magenta Rosé All Day Babelicious BlueFeatures & Benefits: No slip, ultimate grip Pre-folded edge so you can go from the box, to the hair..
Framar 5 x 11 Pop Ups Foil - Back In Black Pop ups save time Easy fold with central crease for ultimate control No Cutting, No Folding, No Hassle Easy to use at all stations, minimal space required, allowing for Optimum organization Ultimate grip, non-slip embossed foil Size: 5"x11" 500 Sheets ..
Framar 5 x 12 Pre-Cut Embossed - Star Struck SilverFlip the lid and the box for these pre cut hair colouring foil turns into its own self dispenser for an easy grab and go concept. Weights Available: Light Heavy Size: 500 SheetsFeatures & Benefits: Box turns into its own self dispenser No tissue..
Framar 5 x 12 Pre-Cut Smooth - Star Struck SilverFlip the lid and the box for these pre cut hair colouring foil turns into its own self dispenser for an easy grab and go concept. Weights Available: Light Heavy Size: 500 SheetsFeatures & Benefits: Box turns into its own self dispenser No tissue..
Framar 5 x 12 Pre-Cut Smooth ColorsFlip the lid and the box for these pre cut hair colouring foil turns into its own self dispenser for an easy grab and go concept. Colors Available: Blue Gold Size: Medium - 500 Sheets Features & Benefits: Box turns into its own self dispenser No tissue..
Framar 5 x 7 Pre-Cut Embossed - Star Struck SilverFlip the lid and the box for these pre cut hair colouring foil turns into its own self dispenser for an easy grab and go concept.Size: 500 SheetsFeatures & Benefits: Box turns into its own self dispenser No tissue..
Framar 5 x 7 Pre-Cut Smooth - Star Struck SilverFlip the lid and the box for these pre cut hair colouring foil turns into its own self dispenser for an easy grab and go concept.Size: Light - 500 SheetsFeatures & Benefits: Box turns into its own self dispenser No tissue..
Framar 5 x 7 Pre-Cut Smooth ColorsFlip the lid and the box for these pre cut hair colouring foil turns into its own self dispenser for an easy grab and go concept. Colors Available: Magenta Blue Purple Green Size: Medium - 500 SheetsFeatures & Benefits: Box turns into its own self dispenser No tissue..
Framar 8 x 10.5 Pop Ups - Star Struck SilverThese pop up hair colouring foil slide out easy with an embossed finish. No slip, ultimate grip. Sheets tear in half to make 400.Size: 400 SheetsFeatures & Benefits: No slip, ultimate grip Slips out for easy access..